You are so active and alert these days. This past week I had to go to work for a training class and after you would eat you would just smile and look around. You love to look at lights and ceiling fans. You track little toys with your eyes. When I am changing your diaper we play with a little stuffed animal, Woozle. He always makes you smile. Speaking of diaper changes, you seem to enjoy those much more now than when we first brought you home. Once you are naked, you are all smiles. When I am changing your clothes each morning and oftentimes during the day when you have a spit up, I love to kiss your belly. One night last week while I was kissing your belly, you reached up and grabbed a big chunk of my hair. Boy did that hurt! Even though it hurt I still thought it was pretty funny. That combined with the fact that I love to kiss your soft little skin keeps me doing it each day. In addition to your Woozle, you also love the mobile in your crib. In the morning when I take a shower I will lay you under the mobile so you can listen to your “music”. You smile and coo for a good 15 minutes which is just enough time for me to get clean and ready for the day. You are enjoy your Tiny Love play mat. It is black, white and red and has little toys dangling from above. We lay on the mat together and we sing songs and play with the little toys. We try to have some tummy time each day, but you don’t much like the tummy time. You still love to walk around in the Maya wrap. Whenever we go to the grocery store or Target or even tonight at PEO, we wear you in the sling. I’m amazed when other people inquire about it. Tonight at PEO a woman asked me if I got tired of carrying you. When I explained to her that you like to nap in the sling. I said no, I love to have you close to me. I could tell by the look in her eye that she didn’t approve of me carrying you all the time. Just one more person that thinks I am spoiling you at 2 months old. Some people. You are still waking up at night quite a bit, but no more than I imagine most other two month old breast fed babies wake. You typically go to sleep around 9 or 9:30 p.m. On a good night you will wake up around 2am and 5 am to eat, then up at 8am for the day. On a not great night you will wake up at 11:30pm, 2am and 5am. On a really not so good night you will wake up at the same times as a not great night and then refuse to go back to sleep at one or several snack times. Last night seemed to be one of those really not so good nights. For some reason, you just didn’t want to sleep in your crib. Even though you were sound asleep, as soon as I put you down in your crib you would wake up. Finally we just brought you in bed with us. I think your dad and I both love having you in bed with us. Typically, every morning after your 5am feeding you just stay in bed with us. The crunchy company I have been keeping lately is very co-sleeping friendly. Unfortunately, the other men your dad works with aren’t quite so granola. Just yesterday at work a few of his co-workers were discussing how bad co-sleeping is. Hempf. Well, we like it, you like and it works for us. To each their own I suppose. I must say as far as experiences with a baby go, there isn’t anything quite like waking up to feel the morning sun on my face. Under the covers I feel your dad toes gently rub against mine and when I turn over I feel your warm little body next to me lying between us. You are so sweet in your little pajamas. You are what we have deemed as a happy spitter. 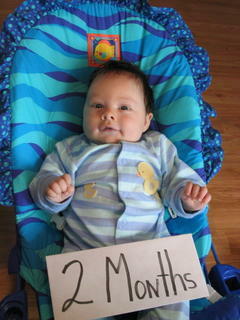 You must go through a minimum of three bibs and two burp cloths each day with all of your little spit ups. I must remember to ask the doctor tomorrow just to clarify that everything is ok. I never thought I could love someone other your dad with such great passion and such all encompassing strength. But alas, I do love you….just a little more each and every day. I am sitting here thinking how excited I will be when you can talk and run and tell me that you love me back, but I will not wish away all the special milestones in between now and then. When I really think about it, I already know that you love me too even if you can’t say it. How do I know? Your milky smiles, the way you look at me when I sing silly songs to you, and the way you fall asleep in my arms like there is no other place in the world that you would rather be. 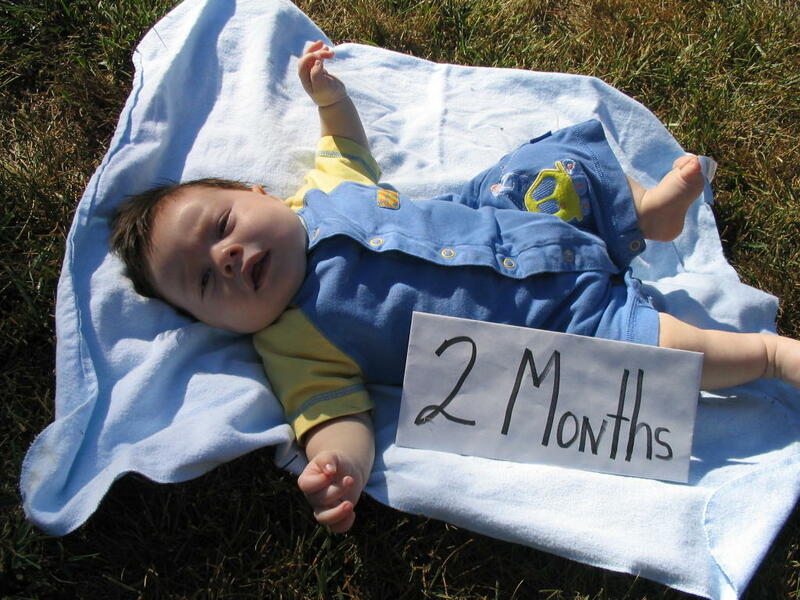 Happy 2 month birthday, my son.